SES America successfully completed installation of 24 task-specific, solar powered Dynamic Message Signs M5000 SOLAR at nine locations across Cape Cod, MA. 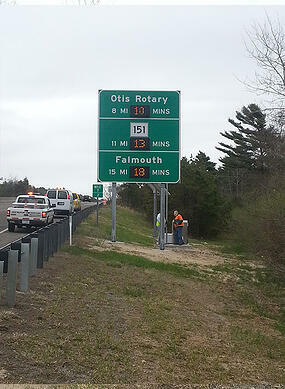 The installations are part of the Massachusetts Department of Transportation’s Real Traffic Time Monitoring initiative aimed at relieving congestion on highly-trafficked areas of Cape Cod during the busy spring and summer tourist seasons by providing travel time information to motorists at key locations along busy stretches of highway. Information is provided via the use of Bluetooth readers in conjunction with the travel time modules – all powered solely by the use of solar panels. Each sign uses state-of-the-art, high efficiency display boards outfitted with high-intensity LEDs and a patented tilting mechanism capable of refining the viewing angle to ensure the travel times are visible to all passing motorists. This contract was a real challenge as detail design and complete DMS production had to be made in two months to meet contract deadlines. SESA team and its partners are proud with this achievement. As part of the project, SESA will also install three full size, solar-powered DMS - the first fully solar-powered, full size DMS ever installed in the commonwealth.